On this and the following page/s , you will read reports of some of our activities during the year. Some of the reports will contain accompanying photographs. Extra pictures may be viewed in the gallery. On February 15th the Kelsall quiz team, Ro , Joan E, Sue H and myself, joined 18 other WI quiz teams, in Tarvin, for the first round of the Federation Quiz. Sue thought she was safe as our reserve but because Evelyn had to pull out at short notice, Sue stepped into the breach. The questions were fair and varied although there was a bit of an altercation when the quiz master (mistress) asked what it was that formed the crust on top of a crème caramel! Our geography was tested with mountains we had never heard of – the Hoggar mountains, the Paine mountains, Marmolada & Galdhoppigen, to name a few and we had no idea what Isaac Newton, Beethoven and Elizabeth l had in common – they never married! In the end we finished equal 5th, not a disgrace by any means. The winners were Tarvin, closely followed by Audlem and we wish both teams well in the final. 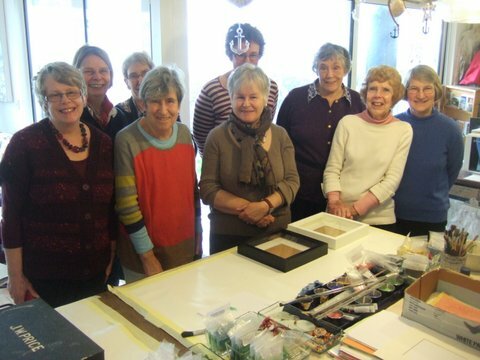 On a rather blustery day in January nine members from Kelsall ventured forth to Shore Cottage Studio at Thurstaston. 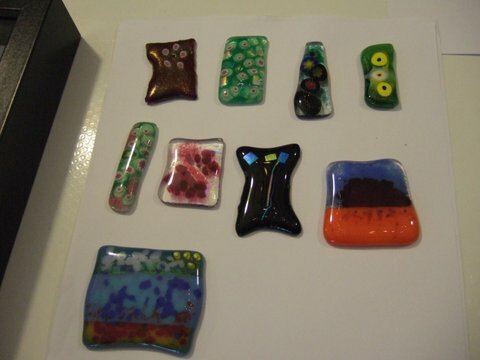 After an interesting climb down onto the beach we arrived at the studio to be given a warm welcome, hot coffee and delicious, freshly baked biscuits - a very good start to our glass fusion workshop! As we enjoyed the refreshments we were able to take in our surroundings. 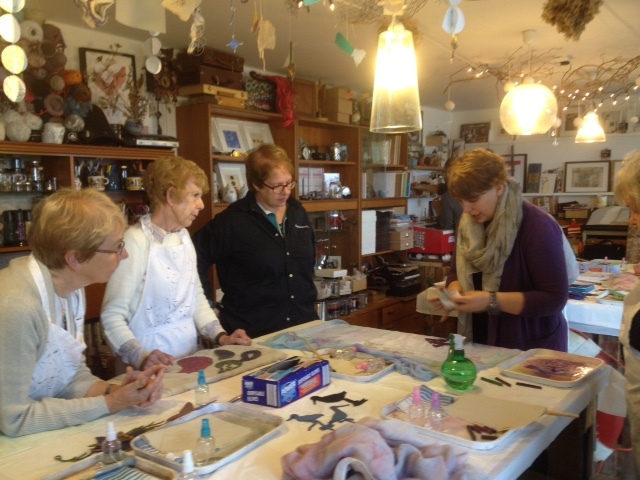 The studio was like an Aladdin's Cave full of examples of finished crafts, driftwood, shells, feathers, and so much more to inspire you to be creative. It wasn't just the inside that was inspirational. There were large double glazed windows which kept out the sound of the stormy weather but afforded the most wonderful, ever changing views across the Dee estuary and over to North Wales. We were told about the different types of glass and the microwave process which allowed it to fuse and then we set about deciding what we wanted to make and what colour glass we needed. Most of us made pendants but Pat and Audrey made pieces which they mounted, embellished with driftwood and put into box frames. Whilst we were waiting for the glass to cool we were treated to more coffee and delicious cake and we were able to watch the Welsh coast appear and disappear in the mist that was hovering over the water. Once the glass was cool we were able to finish the process, turning the piece of glass into a necklace, brooch or picture. It was then put into a presentation box and bag making the finished piece look most professional. Before climbing back up to our cars and a convivial lunch in The Cottage Loaf we thanked our hosts for a most interesting and creative morning. Thanks to their talents, welcome and support we left in good spirits each carrying home a momento of the morning. It was obviously a very successful workshop as several of the pendants have been spotted being worn at social events around the village! 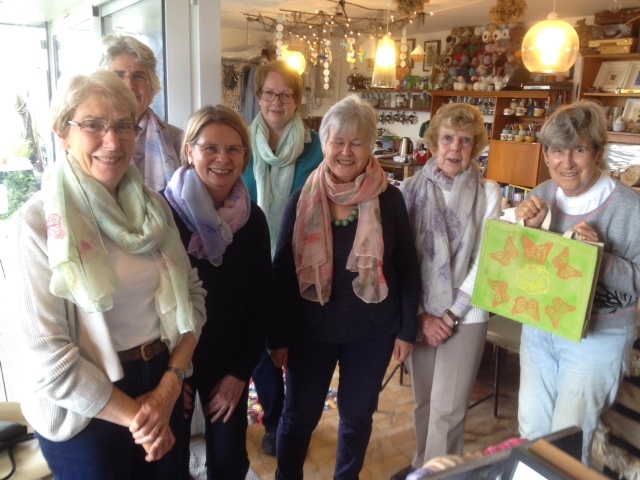 ​Wednesday 28th June saw a second visit by Kelsall WI to Shore Cottage Studio at Thurstaston on the Wirral. Seven members set off for a morning of printing. 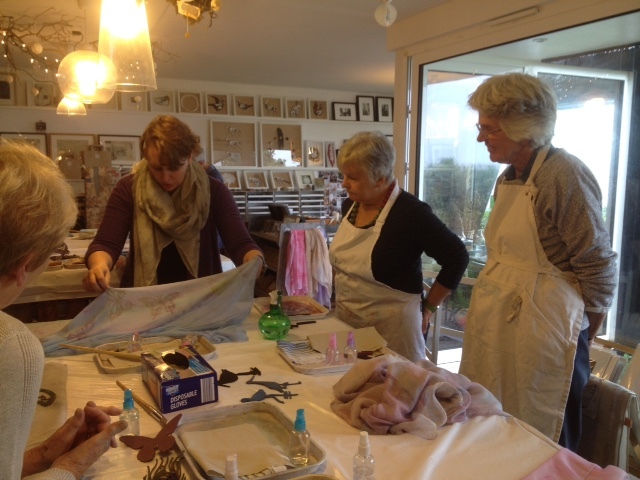 Six of us chose to print scarves and Evelyn chose to print a hessian bag. The process of using the Inktense sticks and the printing blocks was fairly straightforward but which colour and which block to choose was very difficult as there were so many options! 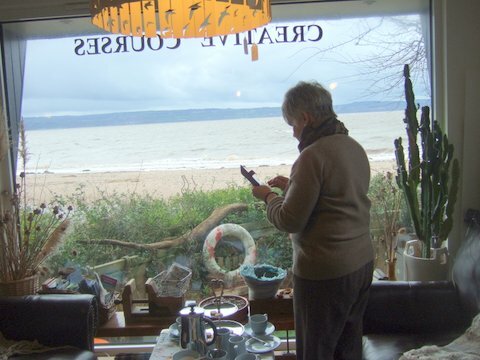 Eventually work was underway and the time flew - we stopped only for coffee, delicious cake and a moment to admire the wonderful view from the studio windows across the Dee Estuary. We all left with an excellent piece of work and before returning to Kelsall we enjoyed a convivial lunch at The Cottage Loaf.